Is Canada failing to live up to its human rights commitments with its arms deals? 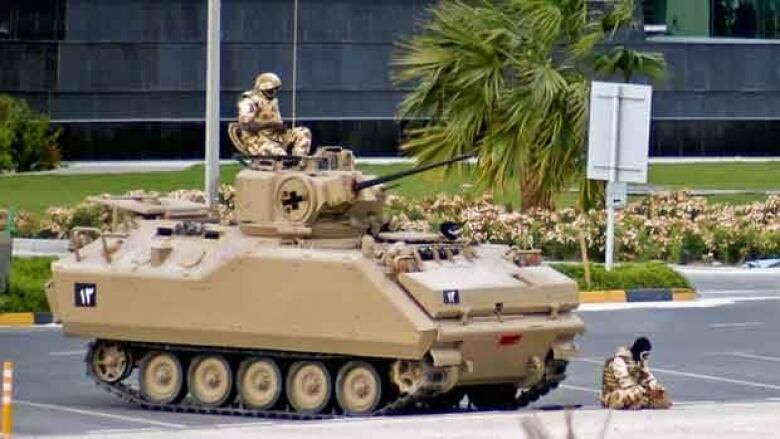 While Canada condemns the spate of executions in Saudi Arabia, it isn't calling down its $15 billion armoured vehicles deal with the kingdom. While that deal may be the biggest, it's not Canada's only arms deal with countries with human rights issues and internal conflicts. Canada has condemned a spate of executions in Saudi Arabia, but says it won't call down its $15 billion armoured vehicles deal with the kingdom. While that deal may be the biggest, it's not Canada's only arms deal with countries with human rights issues and internal conflicts. Cesar Jaramillo, Executive Director of Project Ploughshares, argues that Canada is breaking international agreements and Canadian law by failing to be transparent about arms deals with countries including Afghanistan, Egypt, Libya, Ukraine, Bahrain, Iraq, Colombia, and others. recurring theme with this contract has being a lack of transparency. This contract has been shrouded in secrecy since it was announced in December of 2014. You fast forward to today and there isn't that much more that we know about the details of the contract. BB: According to our own regulations, the way that I understand it, Canada is only allowed to sell arms if there is no reasonable risk that those arms will be used against civilians. Is there any way to determine whether Canada has made that clear in the case of Saudi Arabia? CJ: Yes. There is an absolutely clear way to determine, and there has been no clarity. There has been no clarity whatsoever about the human rights assessment that should have been conducted as it relates to Saudi Arabia. BB: And for that reason you oppose the deal? CJ: Absolutely, but our primary talking point has not been to say that that she that the deals should be to automatically canceled. Our message has been that we need some answers about the deal and about the process by which it was determined that there was no reasonable risk that Canadian-made goods would be used against the civilian population in Saudi Arabia. BB: You work for a disarmament group. You work for Project Ploughshares. Are you against all arms deals? Would you oppose any sale of weapons by Canadians to any country? CJ: No, not at all, and our position has never of being a blanket prohibition on arms deals. There's a difference between prohibition and regulation, and it is a subtle but important distinction. What we're pushing for is the latter: regulation. That is informed by principles of transparency so that the Canadian public can know that the economic well-being in Canada is not being tied to the suppression of human rights elsewhere. BB: Here's our former Foreign Affairs Minister, John Baird, talking about the economic well-being in Canada on Power and Politics this week. John Baird: The fact that the current government is honouring the commitments of the previous government, I think, says all you need to say. It obviously isn't that bad. Obviously, we have a lot of military jobs in Canada and we export to a lot of countries. BB: What do you make of that argument? He says Canada's going through rocky economic times. These deals are huge business. They represent Canadian jobs. Are you asking for a level of idealism that Canada can't afford right now? CJ: No, quite the contrary. What we're asking for is pragmatism. The answer of the former minister is the slippery slope. If you only consider economic considerations, then what's to stop Canada from selling weapons or military exports to the Islamic State or to North Korea or to other rogue regimes? How do you reconcile the authorization of this deal with the existing regulations that are intended precisely to prevent Canadian-made goods from going to countries with questionable human rights records? BB: Your organization has put together a list of twenty countries that Canada does sell weapons to that you think are problematic. What is the criteria for being on that list? What does it take for a country to be someone that you think we shouldn't be dealing with? CJ: The criteria is not set by us. The criteria is set by the Canadian government. The Canadian government says that Canada closely controls the export of military goods. I'll name two categories that it refers to. One is countries that are involved in or under imminent threat of hostilities, these are conflict situations. The second is governments that have a persistent record of serious violations of the human rights of their citizens. There are countries in both of these categories that have in the past received Canadian-made military exports. BB: The countries on the list include Afghanistan, Nigeria, Colombia, Egypt. Do they fall into either of those criteria that you just described? CJ: Absolutely. The first criteria, countries involved in or under imminent threat of hostilities, would include Afghanistan, Egypt, Israel, Nigeria, Philippines, Libya and others. Another the second category, countries whose governments have a persistent record of serious human rights violations, you can find countries like China, Indonesia, Jordan, Saudi Arabia, South Africa, Tunisia, and Bahrain. So there are countries in both of these categories that are receiving Canadian-made exports. This doesn't mean that we know for a fact they were that these exports are going to be misused, but rather that these are countries of special concern and that Canada needs to be especially careful about seeking assurances that Canadian-made goods will not be contributing to human rights violations. BB: These are the countries that if we're going to trade with, they require another level of transparency, and that's the level that you say is missing from the Saudi deal? CJ: Exactly, we're saying that these are countries of special concern. In the case of the Saudi deal, we think to say special concern is almost an understatement given the dire and well-documented poor human rights record of this country. BB: Last year your organization opposed selling automatic weapons to Ukraine. Why is that? unless and until those situations are mitigated, it is simply not prudent to be selling automatic firearms to Ukraine. BB: But some would say Ukraine is a sovereign state and it needs these weapons for self-defense from Russian aggression. Does that give you any pause? CJ: That might be a valid argument but the criteria is not the sovereignty of the state, but rather the likelihood that Canadian-made goods might be used against civilians, or to or to fuel a conflict, or to enable the suppression of human rights. Would Australia's gun-control model work in the U.S.? Why are Hong Kong publishers disappearing?